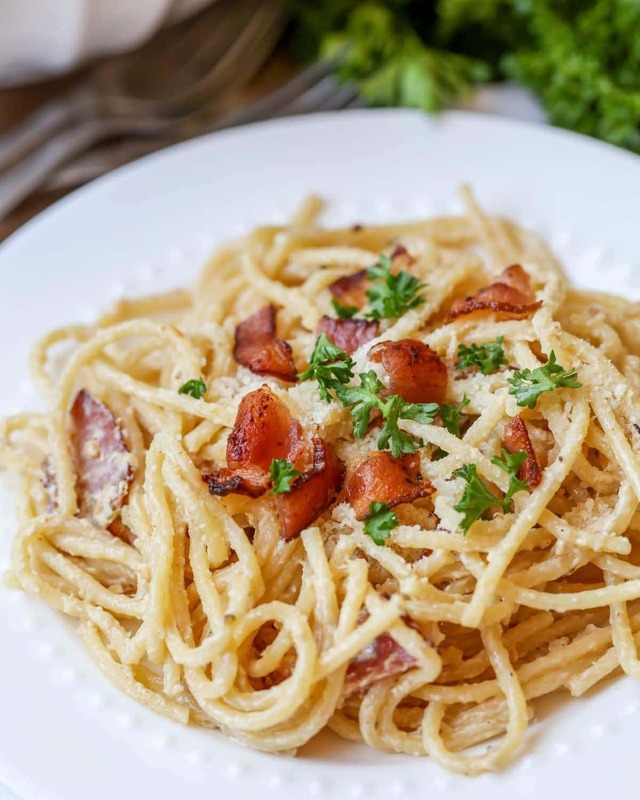 Spaghetti Pasta Carbonara – a delicious and flavorful pasta dish that has cream cheese and Parmesan cheese along with bacon and Parsley. You can never go wrong with pasta! Am I right?? Pasta recipes are always well received with my family. And in fact, pasta is one of a few dishes that my entire family will eat without any complaints. Because of that, we are always on the look out for delicious pasta dishes. 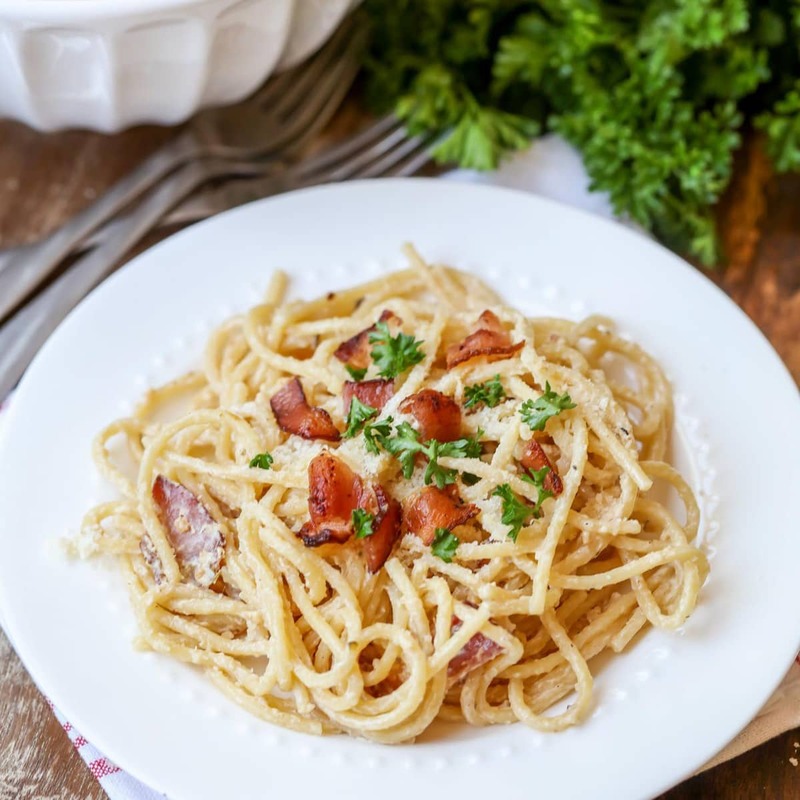 I had always wanted to try Spaghetti Pasta Carbonara knowing that cheese and bacon were involved, and the whole family loved it! Sounds delicious right?! You guys know I’m all about simple, yummy dinner ideas and this Spaghetti Carbonara is one of those. Our version doesn’t call for eggs – but instead uses cream cheese making it extra creamy! I haven’t decided whether I like it better than our regular Spaghetti, but I’m thinking it’s pretty close. This recipe really is quite simple. Begin by cooking the spaghetti as directed on the box. Drain and set aside reserving ½ cup of cooking water. Make the carbonara sauce by mixing together the cream cheese, milk and Italian seasoning in a bowl. Add garlic to a large skillet, then add bacon, pepper and cream cheese mixture. Cook for a few minutes or until heated through. Add ½ cup reserved Spaghetti water and mix well. Combine spaghetti with the cream cheese mixture. Add most of Parmesan cheese and mix. Top with reserve Parmesan cheese and fresh parsley. Serve warm and ENJOY! What type of pasta can be used for pasta carbonara? What add ins can I use in pasta carbonara? How do I reheat pasta carbonara? 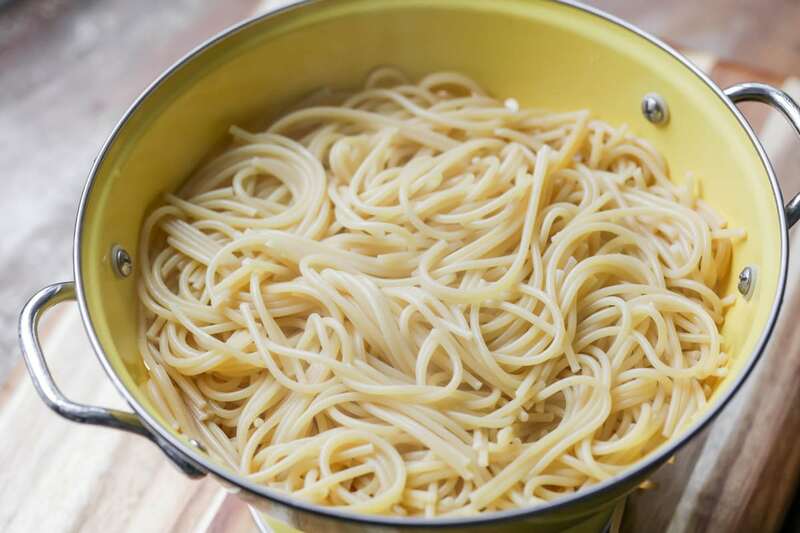 The best way to reheat this pasta dish in on the stove top. Over medium heat, toss the pasta in a skillet for about 5 minutes. If your dish is looking a bit dried out add 1 tsp of olive oil. The kids loved this pasta carbonara! I may have had to omit the parsley for a few of the kids, but other than that, it was a hit! I will definitely be adding this to the meal rotation because it’s so tasty and so simple. 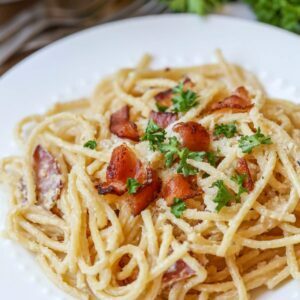 What to serve with pasta carbonara? 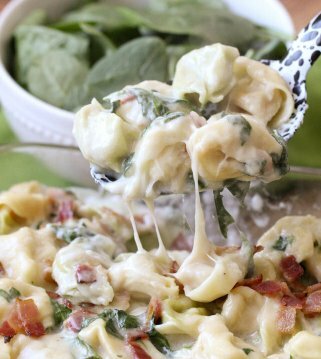 Pasta Carbonara - a delicious and flavorful pasta dish that has cream cheese and Parmesan cheese along with bacon and Parsley. Cook spaghetti as directed on box. Drain and set aside reserving ½ cup of cooking water. In a small bowl, mix together cream cheese, milk and Italian seasoning. 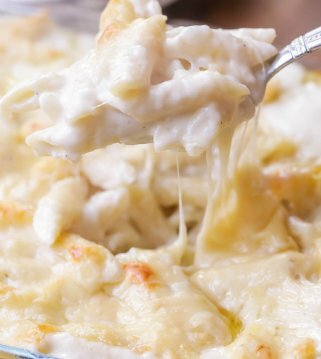 Combine spaghetti to cream cheese mixture. Add most of Parmesan cheese and mix. Hey – this looks great – I recently had a great spaghetti salad, I was wondering is there a way to turn these great flavors into a salad, without it becoming ‘clumpy’? I haven’t tried these ingredients in a salad. I’ll have to look around and see what I can find or come up with. If you find something, let me know! I’d love to know! This past was delicious!! Yum! 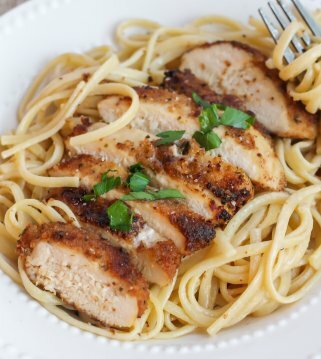 I am making this for the second time tomorrow and wanted to let you know I added both chicken and asparagus the last time and will be doing the same tomorrow – it’s so good! Yay!! SO happy that you found a keeper!! We love this stuff!! Thank you for letting me know! I just love Spaghetti Carbonara. Lots of garlic is a must! Its so easy to make and if you don’t hesitate on using real ingredients, there no better dish! I usually eat it at least once every two weeks. If its a weekend i usually treat myself with som good red wine to it. I agree…we eat this frequently!! Thanks so much for stopping by! 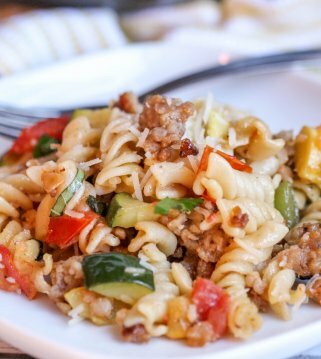 A great paSta dish without the sauce. Not much for going out to eat italian food but enjoy making it at home. A good dish to try! This is such a delicious recipe! My picky eater, even liked how simple, yet tasty it was! My kids gobbled this up!!!! A new favorite. 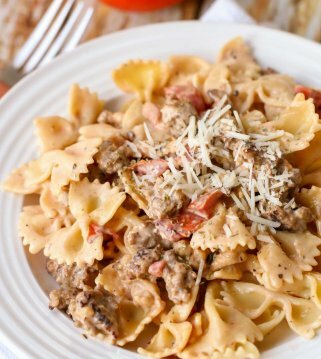 This recipe is the BEST and quickest weeknight recipe! My entire family loves it. 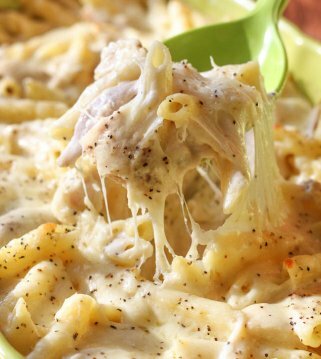 This is on my menu for this week! One of my daughters favorite. She loves Pasta! and this recipe! My kids love pasta but i get tiRed of the usual spaghetti and alfredo dishes. This one will DEFINITELY get put in the ROTATION. Thanks for posting!